I moved to Eugene, Oregon four years ago, primarily for graduate school, but also for the amazing mountains and forests that constitute Oregon. My first hike in the area happened to be on September 28, 2002 when I was climbing the Twins with a groups of UO newbies. We happened across a crazy event: a handful of people running 60+ miles through the mountains (i.e. the first annual Where’s Waldo race). We actually got to see some of the runners as we were coming off of the twins (see “high school kids” in John Pearch’s ’02 report… come on John, I’m in grad school 🙂 I had never heard of anything like this before, but I immediately knew that it was “awesome” and that my time would come to run this race. I came into this year’s Waldo without a ton of ultra-running experience. I had been running some of Oregon’s 50/60k races over the past two years, but this was to be my first step up to a 100k. The course is essentially by backyard, Willamette Pass area being my “standard” hiking and backcountry skiing destination, so I knew the course very well. That was my advantage affording me some opportunity to strategize. Knowing that this was a tough race, my primary goal was simply to finish. If I could finish the race I would score enough points to win my division in the Oregon Trail Series (and even though my division is arguably one of the least competitive–along with men’s 70+ and women’s 60+–it was my attainable pre-season goal and definitely worth going for). Secondarily, having run the opening and comparing my times with previous year’s splits, I thought that I may have a shot at Finding Waldo, though I may pay for it later. My plan was to take it quick at the beginning, avoid being stuck in a pack on the first descent and then take it easy after climbing Fuji. The clock ticked up to 5:00am and we were off. I felt stupid taking a lead in the first 100 yards of an ultra, but Lewis Taylor (fellow Eugenian) was there to do it for me. He deserved that lead as he eventually finished 2nd overall. He set a solid pace for the first section, so Win Goodbody (relay runner) and I tagged along all the way to Gold Lake. We didn’t linger long in Gold Lake before leaving; and Lewis took off like a bat out of hell. I decided that I wasn’t going to keep up for the initial climb, but I’d check in at A2 and see how far ahead he was. The climb up Fuji was actually a lot easier than I was expecting. There were lots of downhill breaks in the climb that made for a nice run/powerwalk rhythm. Eventually I made it up to A2 knowing Lewis was somewhere in front of me and Win was somewhere behind. Since we were starting to catch the tail of the early starters, the volunteers at the aid station had no idea how long ago Lewis had come through so I took off up the mountain trying to catch him. I said that I’d come back and hang out with them for a while on the way down and they pleasantly cheered me on up. I probably should have hustled up Fuji a little faster, because Lewis ended up only beating me by a minute or two. Win eventually caught me and we climbed the last bit together. OK _great_ view! Now it’s time to relax and conserve! On the turn around it was nice to see where everyone was. Craig Thornley and Jeff Riley (team Sunsweet) were about 1.5 miles behind me, and Sean Meissner and a bunch of others were following shortly behind them. Sean never missed an opportunity to compliment me on my socks, which happened to be from his race. I knew that it was only a matter of time before this crew caught me. I stopped in at A2 for a while and refueled. I lost a place, but it was OK, I just needed to finish the race now. I cruised down Fuji to Ray Creek and refueled there getting ready for the next climb. At this point Krissy Moehl flew in and out of the aid station while I was left stuffing Oreos in my mouth. After some help and encouragement, my friends Kevin and Laurel sent me up the Gold Lake trail. I passed a few more early starters on my way up to the Twins and eventually pulled into A4 after a long walk withsome side cramps (which didn’t subside for the rest of the race). As I took my sweet time at the aid station, the inseparable Sunsweet twins, Thornley and Riley finally came through with Meghan Arbogast a minute or two ahead of them. They all took off before I had finished refueling so I knew that I needed to get out of there. The trail down to Charlton Lake was a beautifully smooth descent which gave me a chance to catch up to and pull into A5 with the Sunsweet twins. The second half of the race was a bit more of a blur. Before Rd 4290 (A6) the course transitions to the east side of the Cascade divide. Some of the area had been logged relatively recently and the trees don’t grow back as quickly in the drier climate. The decreased shade combined with the afternoon sun meant my body was starting to fall apart. My friends Nathan Senner and Galen Martin graciously paced me through a lot of pain. Thanks to Nathan’s help I managed to keep a constant (albeit slow) pace going through the long section from 4290 to Maiden Peak. Sean Meissner and some others caught up with me during this stretch and eventually passed me as I was recovering at the Twins aid station (theme for the day). The course continued to be absolutely beautiful and I regretted not being able to stick around and enjoy it for longer. Carry forward. At the Maiden Peak aid station, my next pacer Galen Martin tagged Nathan out and offered encouragement to get me up those hardest three miles. I’m glad that those are over. After the descent to the last aid station, and the stress of Maiden Peak behind me, I was finally able to relax for the first time in about 20 miles. Kevin and Laurel pampered me once again at the aid station, until I needed to get out of there. With Galen’s encouragement I picked up the powerwalk/run rhythm which had gotten me up Fuji so quickly. Being back in familiar territory, the miles went quickly and soon enough we were jogging back into the ski area where a cheering crowd awaited. I wish that I could go back and individually thank each volunteer and each person at the crossings. People were so helpful and encouraging throughout the race. I never could have finished without their help and the help of my pacers and friends. Thanks to the RDs for putting on (and in Craig’s case, running!) a great race. 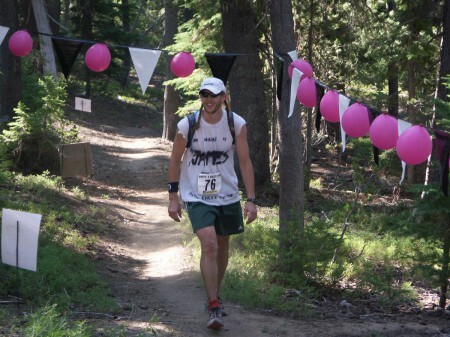 I think that I saw Curt at 5 of the 9 aid stations, which was impressive. Hopefully, I’ll be back next year! I was honored to do this race amongst such a fine group of runners.